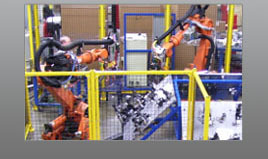 AccuBilt is your complete automation systems designer, builder & integrator! Specializing in precision built robotic and dedicated automation systems for welding, assembly, material handling & automation support. Providing solutions for a wide range of applications and industries. 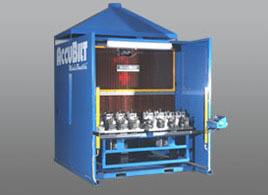 The patented AccuBilt Mini-Shuttle™ is the result of 12 years of development on the larger Accu-Shuttle™ weld cell. Utilizing a compact ceiling mounted 6-axis robot, we have maximized the robots usable work envelope, while minimizing the cell footprint. 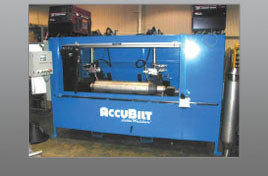 The AccuBilt Lathe Welder is designed to handle a wide variety of rotary welding applications. Utilizing single or multiple MIG torches, this versatile machine can handle small to medium sized cylindrical parts, as well as smaller diameter parts.